The woman, who allegedly stabbed to death her three-year old son, was Wednesday arraigned on a charge of murder. Twenty-six year old Pat Brenda Ferreira was not required to plea to the indictable charge. 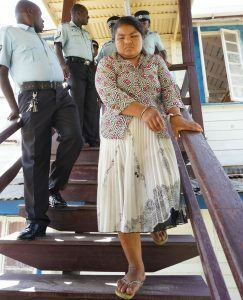 The pregnant woman was remanded to prison until September 12, 2018 by Cove and John Magistrate, Peter Hugh. A preliminary inquiry would eventually be held to determine if there is sufficient evidence for her to face a trial by judge and jury. Ferreira stabbed her son, Ramdeo Ferreira, at their home at Foulis, East Coast Demerara on Saturday, August 25, 2018. She was earlier seen chasing her son with a knife in her hand. The boy was found bleeding profusely on a bed at their home. Police charged the woman with murder after an autopsy was performed on her son’s body. Government Pathologist, Dr Nehaul Singh said the boy died as a result of a stab wound to the heart.